Scientists have developed fluorescent bacteria that encode secret messages, creating a living invisible ink. 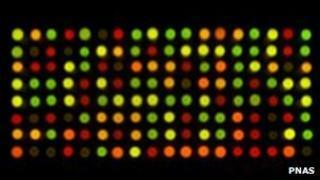 Simple messages can be encoded by genetically engineering bacteria to produce fluorescent coloured proteins, then printing them in a grid. This method could be harnessed for secret communications as well as for anti-counterfeiting. Researchers from Tufts University in the US have published their development of the technique in the journal PNAS. Seven different strains of innocuous E. coli bacteria were genetically engineered so that they each produced a different fluorescent protein. When these bacteria are grown, the colonies appear as bright spots of colour under the correct wavelength of light. The researchers have devised a way of using pairs of these differently coloured proteins to represent letters of the alphabet. Prof David Walt of Tufts University in Medford, US, explained that this coding system is "practical, as it uses seven easily discernable colours in the visible spectrum", but that other coding systems may be developed that make use of other colours and other combinations representing each letter. A grid of the coloured bacteria could therefore be used to communicate messages, with the aid of a cipher to decode the pattern. These messages, delivered by fluorescent bacteria, have been dubbed Spam (Steganography by Printed Arrays of Microbes), and the researchers anticipate them being useful in a wide range of applications. As well as the obvious potential for secret communications, the microbial messages could be harnessed as a deterrent to counterfeiting. The researchers demonstrate how the fluorescing microbes needed to encode the message can be grown from a "bacterial broth", and the message itself is "printed" in a grid onto a growth medium like agar jelly. The bacteria do not become coloured until they are "developed" using specific chemicals, so the invisible, undeveloped message can be transferred onto a velvet sheet and delivered to the intended recipient. Once received, the message can be transferred from the velvet back onto a growth medium, and then developed, allowing the colours to show. The developed message may then be decoded in a variety of different ways. Some of the genetically engineered bacteria will fluoresce differently depending on the wavelength of light shone onto them, so using different lights can result in different messages. In this case, the sender would send a "photo-cipher" that would tell the recipient which wavelength of light will retrieve the message; any other wavelength would result in a meaningless string of letters. Alternatively, in addition to fluorescence, some of the bacteria can be engineered to be resistant to certain antibiotics. This means that when the recipient develops the bacterial array on the growth medium, different messages can result from impregnating that medium with different antibiotics. For instance, the researchers grew the same array of bacteria on media impregnated with the antibiotics ampicillin and kanamycin respectively. When developed, the message grown on ampicillin read, "this is a bioencoded message from the walt lab at tufts university 2011". The message grown with kanamycin read, "you have used the wrong cipher and this message is gibberish". In this case, the sender would deliver the antibiotic-cipher, so that the right information could be developed and delivered. Prof Walt explained the benefits of using Spam messages: "There are multiple levels of security built into it. You have a code and a key that is virtually impossible to break as it is made up of an endless number of combinations of growth media, chemicals and development times." The additional benefits of using a living, bacterial system to encode messages is that the information can be released on-demand. "The undeveloped Spam really are invisible, you can't even see where they are" said Prof Walt. The researchers speculate that these security features will make Spam messages a powerful tool in combating counterfeiting, especially of high value pharmaceuticals, where the consequences of contamination or incorrect dosages are potentially life-threatening. "You could put the cipher code in an undiscoverable location on the packaging, and the array itself in a protected part of the casing," said Prof Walt. "That way, the receiver can authenticate a delivery to make sure it hasn't been tampered with."